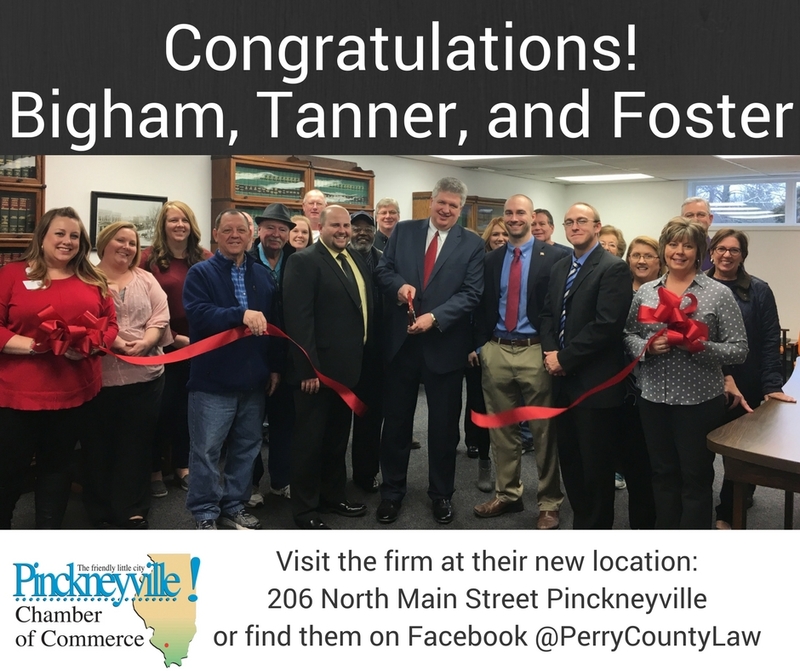 On Friday January 20, 2017 the law firm of Bigham, Tanner, and Foster along with the Pinckneyville Chamber of Commerce hosted a ribbon cutting at 1:00pm. Members of the city council along with Chamber Board Members, and community members gathered in the law firms new conference room for the ceremony. Pictured cutting the ribbon is law firm partner Don Bigham, with partner, Tyson Tanner on the left, associate Charlie Kuhnert on the right, and partner, Matt Foster on far right. Immediately following the ribbon cutting ceremony the law firm hosted an open house until 4:00pm. The firm gave tours of the new building as well as offered food and drinks for any visitors. Anyone that was unable to make the open house is encouraged and welcome to stop by for a tour at 206 North Main Street in Pinckneyville.